With one-way Business Class awards to Japan/South Korea at 21,000 miles, this is one sale you want to take note of. Aegean’s Miles + Bonus program has some excellent Star Alliance redemption options, and recently started allowing online award bookings (although you need to have sufficient miles in your account before doing a search). The program has historically sold miles at a 40% or 50% bonus, but from now till 24 November, you can get an amazing 100% bonus when buying miles. The promotion page does not state a timezone, so I’m going to assume it’s Athens. If so, this means you have until 6 am SGT on 25 November 2018 to make your purchase. However, buying 60,000 miles for 750 Euro is still the equivalent of paying 1.96 SG cents per mile, which is fantastic value. Miles + Bonus only requires 42,000 miles for a round-trip award within the Far East, which includes not just Singapore, but countries as far away as Japan, South Korea and China. If you buy miles at at a 100% bonus, you’ll be able to redeem a one-way Business Class ticket between Singapore and Tokyo (or Seoul, or Osaka, or any other of SQ’s Japan destinations) for the equivalent of ~S$460 (21,000 miles + S$47 taxes). A few important caveats to note about this: as a partner program, Miles + Bonus will not have full access to SQ premium cabin space on selected aircraft. I recently learned that even the new regional business class on the 787-10 aircraft is being blocked from partner programs. So you can forget about buying Miles + Bonus miles and redeeming for Suites, or any premium cabin products on flights flown by SQ’s B77W, B787-10, A350, or A380. 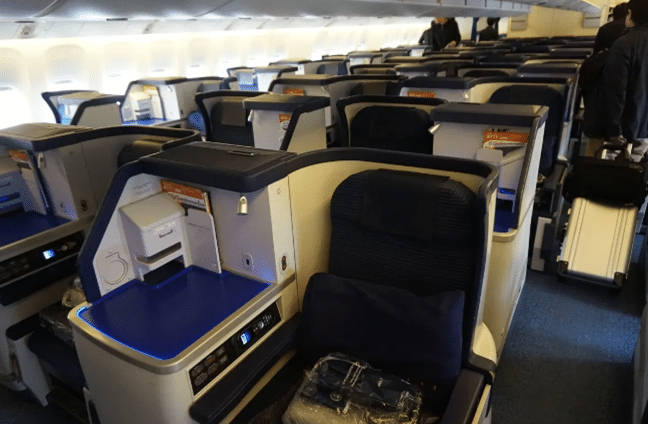 That said, you’re still able to book ANA Business Class awards to Japan, or take connecting flights. You’re also able to book any SQ premium cabin awards on flights operated by A330s, B777-200s and B777-300s. At a 100% bonus, this sale even gives the Alaska Mileage Plan trick a run for the money. 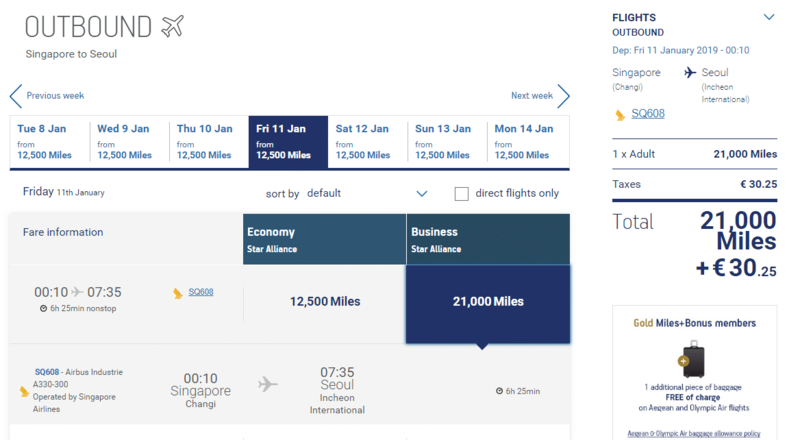 Assuming you buy Mileage Plan miles at a 50% bonus, or 1.97 US cents each, you’re paying ~S$760 for a round trip flight (plus the cost in terms of time and money of positioning yourself on the outbound or return leg). Aegean does pass on fuel surcharges where they exist, but for flights to Japan and South Korea they’re relatively minor. You can use your Miles + Bonus miles to book an award flight for anyone, there is no redemption system like there is for KrisFlyer. As another reminder, you will not be able to use the M+B search engine unless you have sufficient miles for the route in question. So, for example, I would need 21,000 miles to look for Business Class space on SIN-NRT. You can always use other methods to search for Star Alliance award space, and what is seen by other programs should be what M+B members can see too. Your M+B miles will remain valid so long as there is one redemption or accrual activity in your account once every 24 months. You pay only 20 Euros for any changes or cancellations. These must be done at least 30 minutes before departure. M+B allows you to pool miles with up to 5 friends. You’ll be able to see this option when you log into your M+B account. You need to be at least a Silver member to pool miles (Thanks Lionel). What card should I use to buy? Be sure to check out our Black Friday deals page to see if there are any bank spending promotions you can take advantage of too. I don’t normally recommend buying miles speculatively, but a 100% bonus is going to give me some serious things to think about. There are some other sweet spots in Miles + Bonus for flying point to point outside of Singapore, which you can read about here and here. We’re going to be covering Aegean Miles + Bonus in more detail during Saturday morning’s Alternative Frequent Flyer workshop. Come and learn how to get the maximum value out of this sale! So based on the aircraft used, SQ business class to London wouldn’t be accessible via this- how about other SA partners, do you know if their premium cabins to London would be bookable via this programme? A heads up for miles pooling, be prepared to be randomly (of selectively) audited by M&B to provide identification and proof of address for all friends pooled together. Otherwise your miles would be freezed and not able to do any redemption anymore. why buy these miles at 1.9c when the lifemiles ia 1.375c? 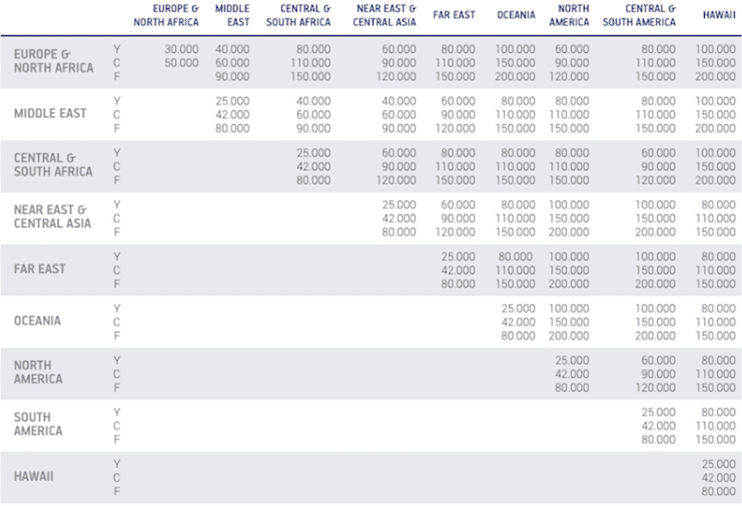 Redemption rates are not the same: Singapore to Tokyo one way business is 21K on Aegean and 36K on Lifemiles (if you don’t count the current promo of SIN-NRT of 29K). 1.375 is US cents. 1,9 is Singapore cents. Anyone managed to find more than 1 award seat on SIN-TYO or TYO-SIN? When I try 2pax for travel in Jul19, all awards close out. I searched using UA’s website. Update: When I search SIN-FUK, I could get a flight. Not quite sure what’s wrong. I don’t think NH releases FUK-CTS for business class, at least I could not find it on UA. M+B does not allow mix-cabin like UA or Lifemiles, so you can’t price business + economy on M+B website. Hi everyone, just curious if anyone is experiencing issues purchasing the miles? I’m using a dbs altitude visa card, but i get the message. Tried changing browser but still no luck. Time is running out for the sale too ? Yes, just had the same issue as well. Tried DBS Woman’s Card and Altitude Visa. Same error. Yes. Used a different card and it went through as well. Apparently, there’s some issue with DBS’s 3ds. Which card will work? 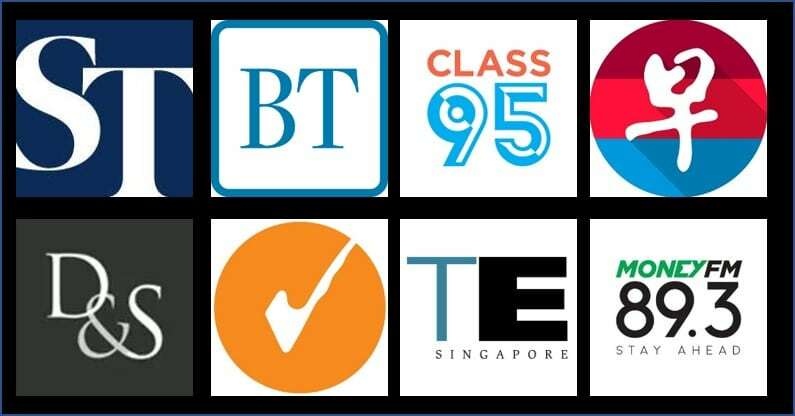 Having trouble with both Citibank and DBS cards. I have bought miles from them on Fri and the next day I received an email asking me to submit ID photo, credit card photo and proof of address. Anyone encounter this too? I did too. Doesn’t sound right. I refused to provide my details. Very suspicious. I emailed them and they reply insisting on providing them the info. Read in some forum they will disable your account if fail to provide!! What should we do? Aaron, what is your view on this? Previous Entry SilkAir will transfer 17 routes to Scoot- is this bad news for KrisFlyer members?